The best all inclusive resorts for families, with fun and adventure for adults and kids of all ages. Beaches Resorts offer the best all inclusive family vacations in the Caribbean and we’ve stayed & played at all three resorts! In the southern Bahamas you’ll find Beaches Turks and Caicos with four villages, a fabulous water park with surf simulator, waterslides, waterfalls, swim up pool bars, 12 miles of perfect white sand beach, crystal clear turquoise water and every land, water and beach sport imaginable. All included! The newest village, Key West at Turks and Caicos, has 1-4 bedroom suites and beachfront homes with up to 4000 square feet of living space perfect for a family reunion or destination wedding. On Jamaica you’ll find Beaches Negril and Beaches Ocho Rios with more waterslides, a lazy river, water trampolines, waterskiing, golf and more. Each Beaches Resort has everything you need for a fabulous fun filled family vacation and, best of all, everything is included! Younger kids will enjoy parades with Sesame Street characters, splash and play in the water park, build sand castles on the beach, float the lazy river and make crafts in the supervised children’s program. Older kids will race each other on waterslides, join a beach volleyball game, learn to sail or waterski, play ping pong, hit the Xbox center or meet new friends for a dance or outdoor movie. When you’re hungry you’ll find everything from burgers & pizza to lavish buffets and fine dining. Many Beaches restaurants are casual and kid friendly but white glove service is also readily available and all drinks are included, whether a latte in the morning, soft drink at lunch, wine at dinner or martini at midnight. 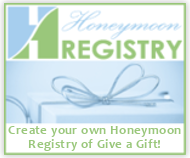 And if you have food allergies or dietary restrictions in your family that’s no problem mon! 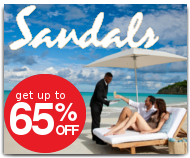 Sandals and Beaches Resorts are an excellent choice for a gluten intolerant vacation or guests with special food needs. Beaches Resorts also offer free destination weddings with a stay of only 3 nights and destination wedding groups can earn free rooms and private functions with as few as 5 rooms. Our Beaches Specialists have been to all the resorts and can help you choose the best island, resort & room category for your style and budget. 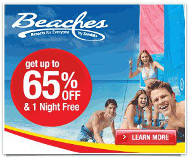 Beaches guarantees the lowest prices available and you won’t pay a penny more for our personal service and expertise. We invite you to browse the resort information, check our Caribbean travel blog for reviews and pictures from recent trips, then call one of our Beaches Resort experts, email or book online. Either way you’ll get exactly the same price and the lowest price available. Get personalized help from a Beaches expert at no extra cost!